Heimars World: Chrisbear für "A Spoon Full of Sugar"
Hab zum 1. Mal eine Chrisbear coloriert...zudem mal mit Polychromos. Die Karte ist nach dem aktuellen "A Spoon Full of Sugar"-Sketch entstanden. Colored for 1st time a Chrisbear image....and I did it with Polychromos for the actual "A Spoon Full of Sugar"-Challenge. What a cute image! Lovely card. Oh this is so cute Heide, love this image - beautiful card. 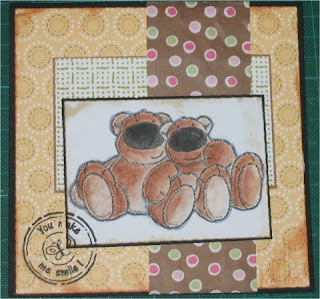 How sweet are those bears, fabulous card.